Messenger bags are the new fashion must-haves, because of its extreme versatility in shapes and sizes. They are the perfect transitional piece from work to play. Created to keep moving, the messenger bag is one of the most urban cool pieces to fit any style or aesthetic. With its custom rectangular silhouette, it illusively shape shifts from material to material; soft leather, suede, structured leather and even jute. Find its functionality in its foldable flaps, convertible compartments and easy shoulder straps. 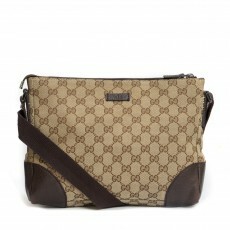 Being the most ergonomic style in women’s handbags, the messenger bag is the new luxury favorite. While being travel easy, these bags have made their way into high-end fashion. Buy pre-loved luxury messengers for your perfectly constructed all day companions. Gucci features crafted bags in a durable GG fabric canvas with leather trims and adjustable canvas straps that can be worn on the shoulder or cross body for ultimate hands-free convenience or Michael Kors’ with its signature hardware, an essential known for being practical and chic. Messengers come in a variety of monograms, quirky patterns in soft leathers, nylon with durable hardware. Luxury fashion has transformed these lightweight nylon carry-ons into smart creative pieces to carry bulky items in style. Although messenger bags were typically created to make it suitable for biking, making them easy to carry various things ranging from laptops, notebooks and stationery. hence having easy shoulder straps with adjustable closings. They have now made their way into high-end fashion that is gender versatile.